Most estimates of global oceanic heat content are carried out by integrating temperature from the surface to a fixed depth (e.g. Ishii et al. ; Levitus et al. ; Polyakov et al. ; Lyman et al. ). While this approach is straight forward, it is vulnerable to the influence of circulation changes and transient phenomena via vertical displacements of the thermocline. The HadGOA approach is to instead carry out the integration from the surface to a fixed isotherm. This method reduces the influence of vertical displacements of the thermocline on the derived analyses. A time series of global 0-700 m ocean heat content anomalies with uncertainty estimates is available from the download page. This new dataset is based on the latest version of the EN3 dataset. The figure below shows the difference in the mean observed ocean state for 1985-2004 minus 1961-1980: a) the mean temperature above the 12°C isotherm; and b) the mean depth of the 12°C isotherm. Positive values indicate a warming above the isotherm or deepening of the isotherm in the latter period. NetCDF files of HadGOA gridded analyses will be available later this year. Time series data for the major ocean basins are currently available from the download page. Please read the terms and conditions. Palmer M. D., K. Haines, S. F. B. Tett and T. J. Ansell (2007), 'Isolating the signal of ocean global warming', Geophys. Res. Lett., 34, L23610, doi:10.1029/2007GL031712. Ishii, M., Kimoto, M. and M. Kachi (2003), 'Historical ocean subsurface temperature analysis with error estimates', Monthly Weather Review, 131, 51-73. Levitus, S., Antonov, J.I. and T.P. 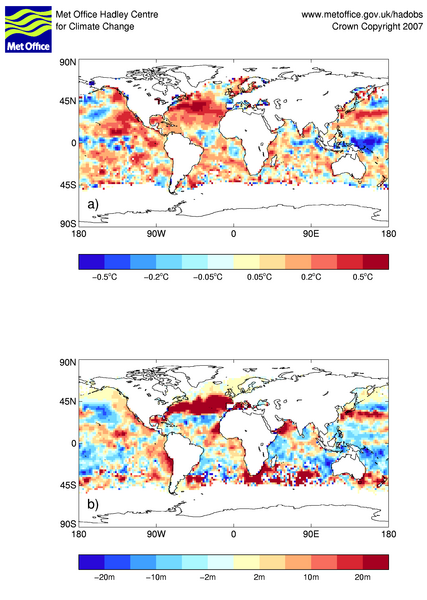 Boyer (2005), 'Warming of the World Ocean, 1955-2003', Geophysical Research Letters, 32, doi:10.1029/2004GL021592. Polyakov, I.V., Bhatt, U.S., Simmons, H.L., Walsh, D., Walsh, J.E. and X. Zhang (2005), 'Multidecadal variability of North Atlantic Temperature and Salinity during the Twentieth Century', Journal of Climate, 18, 4562-4581. Lyman J. M., J. K. Willis, G. C. Johnson (2006), 'Recent cooling of the upper ocean', Geophysical Research Letters, 33, L18604, doi:10.1029/2006GL027033.